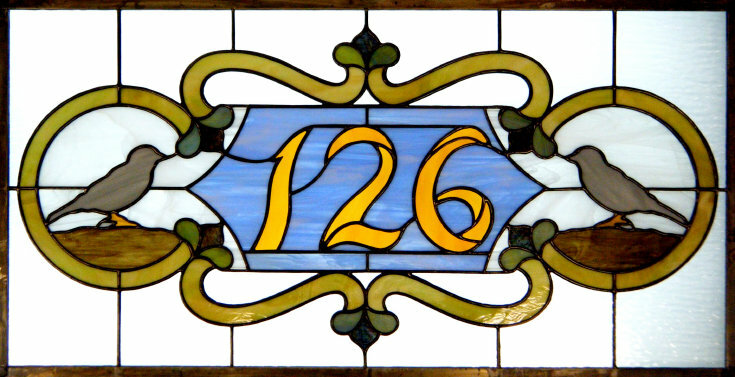 Sandra contacted me about building a stained glass transom for her very slim row house (12 1/2 feet) in Jersey City, New Jersey. 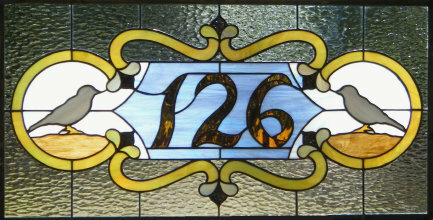 She wanted a transom containing her house number with traditional Victorian design elements and wanted to modernize the design by using circles. 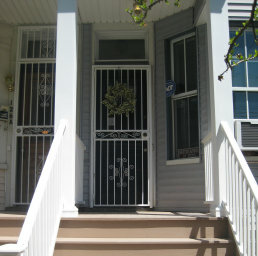 Most importantly, she wanted a single colored sparrow on each end of her transom. After a little research and a lot of swapping ideas with Sandra, together we evolved the present design. 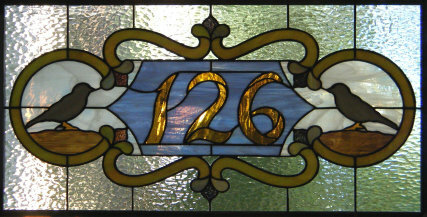 Above are two additional views of Sandra's Transom showing how different lighting greatly affects the coloring of stained glass. The clear background glass is a called clear hammered glass. It lets in 100% of the light but yet affords complete privacy.